Baywatch is a tonal mess of epic proportions. The sheer ineptitude in execution, coupled with the desperation to extract a big budget action/comedy vibe from such a creatively bankrupt project, is almost fascinating enough to warrant a scared straight program for budding producers on how not to kick-start a potential franchise. 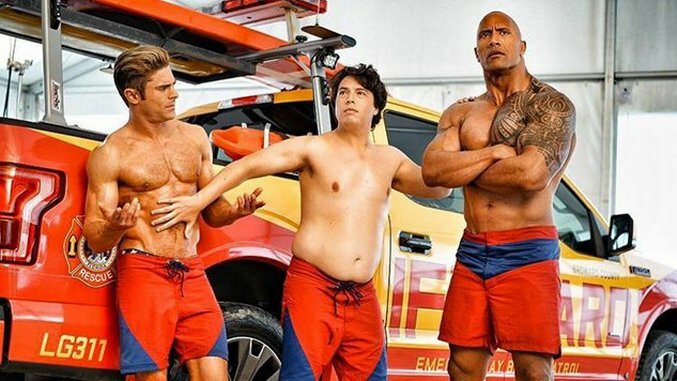 Baywatch was greenlit for the obvious goal of cashing in on the “nostalgia show turned into self-parodying R-rated comedy” approach that started with the two 21 Jump Street movies. Along with the recent release of CHiPs, it’s starting to look like a trend. A cynical and shrewd starting point for Baywatch, to be sure, but it could have succeeded in transcending the source material with some ingenuity and coherence, especially since the original show is such an easy target. Is this supposed to be a modern meta-parody of the Baywatch series? There’s certainly enough satirical real estate in a show that was based entirely on the hypnotic effect of bouncing big boobies in slow motion can have on the average meathead. 21 Jump Street executed the parody elements cleverly, poking as much fun at how pathetic it is to reboot such an old show as a big budget movie as making jokes at the show’s expense. Instead of adopting such a self-aware approach, Baywatch dives into full Zucker-Abrahams-Zucker (or Seltzer and Friedberg, to be more honest) spoof territory. Characters who move in slow-motion while everyone around them exists in normal speed; an aquarium figurine that changes mood depending on the main character’s current predicament; clunky dialogue where the characters practically break the fourth wall to inform us how this silly plot sounds so much like a cheesy TV show: Yes, these jokes are lame and obvious, but they become even more grating when coupled with a movie that honest-to-goodness expects us to take it seriously as a late ’80s-style buddy cop actioner. Baywatch’s characters and plot are insultingly predictable. Take any random Lethal Weapon rip-off and switch the setting from a police precinct to a lifeguard station. Sure, lifeguards don’t have nearly the authority or the experience to do police work, but that doesn’t stop the writers from having their characters completely abandon their jobs in order to pursue an unnecessarily convoluted drug/real estate conspiracy. All that’s needed to get around that leap of logic is to have 40 percent of the dialogue consist of every non-lifeguard character reminding our protagonists that they’re not cops. It also doesn’t help their case when we know that the police—you know, people with actual authority and experience—are 110-percent right. I would have loved to see scenes of one swimmer after the other drown, intercut with the lifeguards spending working hours distracted from their duties by staking out the villain’s (Priyanka Chopra, the only bright spot in the cast, thanks to her natural charisma and charm) drug smuggling operation. This issue becomes especially glaring when Dwayne Johnson’s take on Mitch Buchannon is supposed to create a character who’s slavishly devoted to his job of saving lives at the beach. The odd couple arc between Mitch and Matt (Zac Efron), a narcissistic superstar swimmer who’s placed under Mitch’s authority as part of a community service/PR move, can be visualized by anyone who’s ever seen an old-fashioned buddy-cop flick. Will Matt’s loose cannon antics get under the duty-bound Mitch’s skin? Will they learn to work together as they face a formidable common enemy? Will a stupendously forced second act break split the new friendship apart, only to have it inexplicably glued together in service of the “action-packed” finale? If any of your answers were “no,” I’d love to find out how you managed to steer clear of the last four decades of popular culture. Director Seth Gordon, whose The King of Kong still remains the only halfway decent film he’s helmed, tries to capture a modern “cool” aesthetic for the action sequences (which take themselves way too seriously) by lazily going back to the same well, switching awkwardly between camera speeds while praying that slow-motion shots of Dwayne Johnson’s impeccable pecks will suffice in place of a unique visual style. One scene in particular, where Mitch and Matt rescue victims from a boat on fire, invites unintentional laughter with its horribly obvious CGI fire elements. Did the production outsource its special effects to Asylum Studios? All of this could be forgiven if the cardboard characters had a semblance of chemistry between one another. As much as Johnson and Efron try their best, they mostly look uncomfortable with the subpar material they’re given. The side characters don’t fare any better. A romance sub-plot between a flabby nerd, Ronnie (Jon Bass), and a hot blonde lifeguard, CJ (Kelly Rohrbach), is so obvious with its “dork acts like a fool around his crush” humor that it feels like a community college production of Revenge of the Nerds. I kid you not, they actually dust off the age-old bit where the nerd mumbles incoherently at the sight of the girl’s hotness. This is a scene that exists, without a hint of irony, in a major studio release, in 2017. It also doesn’t help that Bass is the poor man’s Josh Gad, which is quite an achievement since Josh Gad is already the poor man’s Josh Gad. Baywatch has so many things wrong with it that I haven’t even mentioned the slew of late ’90s gross-out humor, which includes a tone-deaf gag that has Matt swallowing body fat melting out of a corpse, as if a producer came out of an 18-year coma and said, “You know what people are into these days? Those crazy Farrelly brothers movies and that flick where the kid screws an apple pie.” Let’s hope that Phil Lord and Christopher Miller can save us from this burgeoning trend once again.